Thanksgiving is here! The Power BI team decided to look for some data and find out where our favorite Thanksgiving meal is produced and how much is consumed. Watch to find out, and then try the visualization, storytelling and sharing capabilities for self-service analytics with Power BI. So how did we build this? We knew we had some great datasets out there (not easy to find though!). Using Power Query for Excel “Online Search” and other online sources, we were able to mash up all that data. 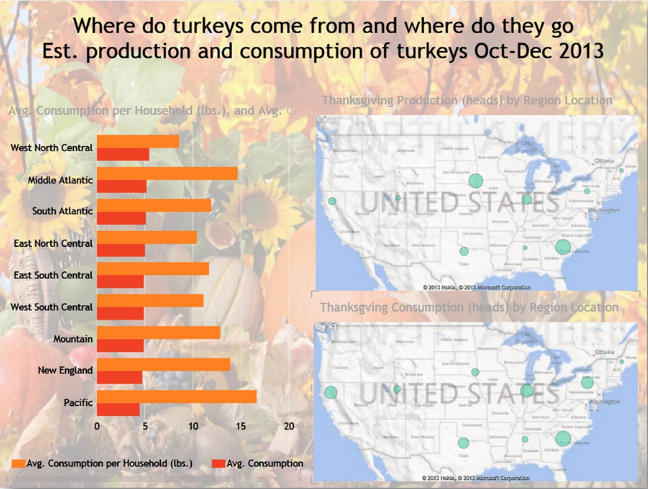 With the Power Query “From Web” capability were able to import great public datasets: ERS’ Quarterly Food at Home for estimating fresh/frozen poultry consumption between October and December, US population by region and state, and ERS’s turkey production by state. Later, using Power Pivot, we calculated our estimates and built a model that brought all the data together in one place. Finally, these datasets were mapped and analyzed geospatially on the 3D Bing map in Power Map and in Power View. Then we added a few cinematic elements (zooms, pans, etc. ), annotations, including images to call out insights, and…Voilà! With the new Create Video feature in Power Map, we exported our creation, and then quickly and easily shared it with all of you on YouTube. But before you head home and enjoy that tasty turkey dinner, right next to other Thanksgiving related meals that we call out with an interactive chart in Power View. With the hope that you can find out more about Power BI and play around with this fun analysis, we’ve provided the dataset used in this demo below! Best wishes from the Power BI team and enjoy this Thanksgiving weekend! Install Power Map Preview for Excel today. Once you are a “Power BI Pro” enter our Demo Contest for a chance to win an Xbox One, Surface Pro 2 and a trip to the 2014 PASS Business Analytics Conference!